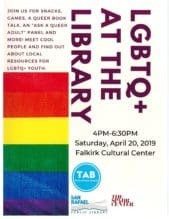 Come join us for snacks, games, a queer book talk, and more! Members of the Q’d In youth advisory committee will be presenting on a panel. Meet new people and find out about community resources!